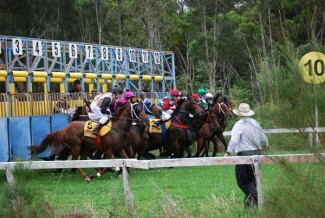 KEMPSEY Race Club will host its first race meeting for 2012 at the Warwick Park Racecourse next Monday. The eight-race TAB meeting, which offers $80,000 in prize money, attracted 120 nominations and 85 acceptances. A strong field of nine runners is expected line up in the feature race, the Akubra Benchmark 70 Handicap over 1450m. Never Doubt Me, trained by Port Macquarie’s Neil Godbolt, will be one of the main hopes. The three-year-old chestnut filly has won more than $150,000 from her 16 career starts and has experienced jockey Marlon Dolendo aboard. Golden Jess from the Wayne Wilkes stable should also go close. Local trainers have targeted the meeting and have runners in all but two of the races. Kempsey’s Tony Green has Ransom Demand and Stuarts Point trainer Barry Welch will start Miss Curlewe in the Chaddies General Store Maiden Handicap over 1000m. Green will resume Emcee Art from a five-month spell in the West Kempsey General Store Maiden Plate over 1250m. Seven-year-old gelding, Calais Lion, will race for Barry Ratcliff in the West Kempsey Hotel Benchmark 60 Handicap over 1000m. Calais Lion has had two starts on his home track for two wins and will come up against Lions Den from the Julie Lynch stable. Glenrock Doney will start for Peter Cooper in the Redback Lodge Class 1 and Maiden Plate over 1900m. Veteran galloper Carbon Art will contest the NBN Television Benchmark 55 Handicap over 1900m for Green. However, Green’s best chance will be in the last race of the day with four-year-old gelding Gives Lip. Jockey Glenn Lynch will ride the former Victorian but has to over come the wider barrier. The race meeting is open to the public and families are invited to attend. Enjoy a great day out at the Kempsey races, gates open at noon with the first race to start at 1.20pm.